CSS (this stands for Custom Style Sheet) is the fundamental code required to give webpages style. You may recall from earlier chapters that HTML sets the physical structure of webpages. Well CSS mostly deals with the style of those pages - like fonts, colours, backgrounds and spacing. CSS is a vast subject area with thousands possible properties. Few experts know the entire specification, but the basics are quite important to know. ID names are unique elements which only appear once on the page. You will typically see something like id="name" in the HTML code Class names are elements which may appear multiple times on the same page. These are often denoted by class="name" in the HTML code HTML tags like headings, list items, links and other formatting can also be selected and have CSS applied to them By far the easiest way to get these selector names is to use the built-in developer tools in a web browser. This is commonly referred to as the 'web inspector' or 'web console'. Most modern web browsers support these tools in one form or another. The two most popular developer tools available right now are the Webkit Inspector in Google Chrome and the Firebug plugin, available for Firefox and Safari. Using one of these tools to get selector names is pretty easy. 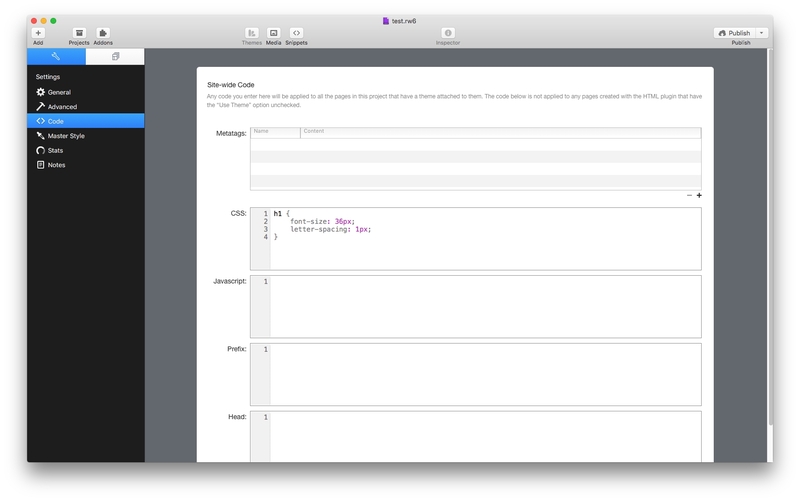 In RapidWeaver, choose to preview the current webpage in one of your web browsers with developer tools enabled. In the new browser window that opens, right-click the desired element in the page you want to change. 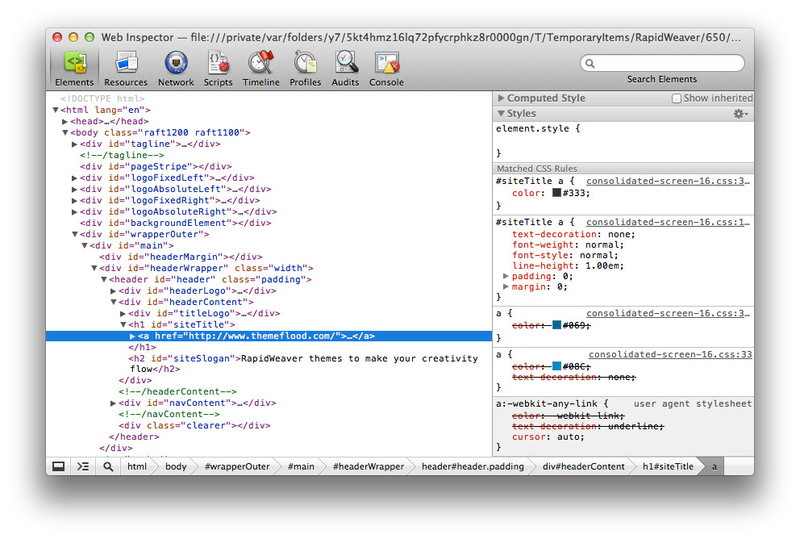 From the popup window, select Inspect Element or Inspect with Firebug. At this point, you should see a window or panel open (like the one pictured below), showing the page source code. This is your route towards seeing the structure of the page and getting reliable selector names, which you can later use for writing your own CSS code. If you are using Google Chrome, do read this brilliant guide on using the Webkit Inspector in Google Chrome. This is great for beginners and equally goes into plenty of detail, covering many aspects of the Webkit Inspector. Straight-away when you start seeing page source code in a developer tool, you can start to see patterns and selector names in the code. Hovering your mouse over a page element will often tell you’re the name of an element. Likewise the WebKit Inspector makes things slightly easier again still, by displaying a breadcrumb at the bottom of the window. This breadcrumb gives an alternative visual representation of an element within the rest of the page. This is super-useful, in that it also tells you the names of the elements you select - especially useful for the next section. You can copy element names from this breadcrumb bar, by right-clicking on them and clicking Copy from the menu. The actual style properties you want to apply go inside a pair of curly brackets, as shown above. There are hundreds of possible style properties you can use, and a website like W3Schools provides an excellent insight into most of them. 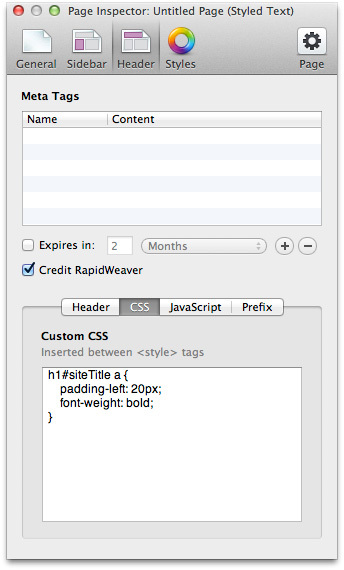 Custom CSS code can either go in the RapidWeaver Page Inspector (within the custom CSS box, pictured below) or you can open the theme contents and place it in the custom.css file (which will apply the code automatically to all pages using the theme). At this point (depending on the theme being used and the element you are restyling) you should start to see changes take effect. This section on CSS customisation really is the tip of the iceberg. There are many thousands of possible options; not only in selecting elements, but also the range of styles that can be applied to those elements. It is best not to start too ambitious and just begin with the absolute basics of CSS. One of the best places to get started is W3Schools, a free learning website which covers everything from basic syntax right up to advanced code editing. Getting the selector names is often the trickiest part (even the experts can run into great difficult sometimes in complex setups). The rest of the code like properties and values are typically copy-and-paste. If you find that CSS code applied to a RapidWeaver theme takes effect in the Custom CSS box, but not the custom.css file (or vice-versa) this might be because the code you are trying to use is in the wrong part of the cascade, and is being overridden by some other CSS code further down the cascade. There are a couple of basic things you can do, to ensure your custom CSS code takes priority. These !important declarations are supported in all web browsers with CSS level 2 support. They tell a web browser that the particular property and value marked as important absolutely must take priority over and above any other conflicting CSS code lower down in the cascade.